In one of the last weeks before the official start of classes, 25 incoming MIT freshmen learned about their new undergraduate home — both on- and off-campus — in a pre-orientation program with a special focus on energy. 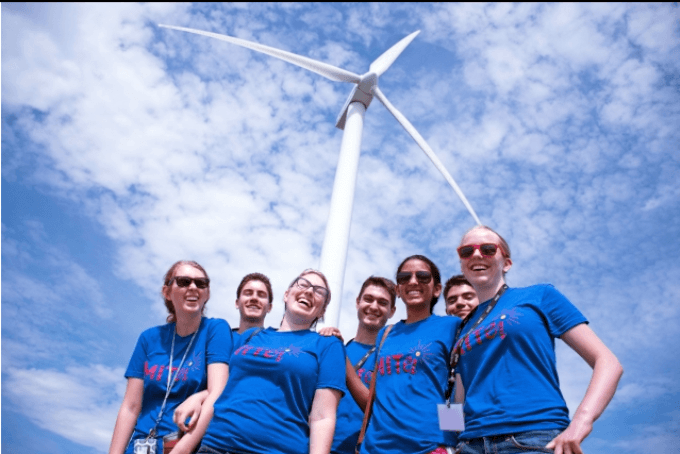 The MIT Energy Initiative-led program, called Discover Energy: Learn, Think, Apply (DELTA-FPOP), was designed as an interactive introduction to topics from wind energy to nuclear power and climate policy — with group bonding activities throughout the week. The next day, the group learned about how wind turbine blades are tested to improve technology development from George Blagdon, a senior engineer at the Massachusetts Clean Energy Center’s Wind Technology Testing Center in Charlestown. On a tour of the immense facility, students saw prototype turbine blades, learned about the technology used to test their integrity, and peered into the interior of an old blade outside the building. The students lunched together in the town of Hull before learning about the wind energy project there from two of the people who have helped make the project a success: Andrew Stern, a community clean energy leader, took students inside the wind turbine to see the controls at the tower’s base, while Panos Tokadjian, operations manager at Hull Wind, answered student questions about the technology and its impact on the town. Another technology the students learned about was nuclear fission. They visited MIT’s own nuclear research reactor, which is unique in the U.S. for involving students in development and implementation of nuclear engineering experimental programs. The pre-orientation program also included two energy policy exercises: an activity led by five MIT alumni prompting students to consider emissions problems specific to Germany, and another led by Antje Danielson, MITEI education director, that made use of a simulator where students adjusted details such as carbon tax or land use to see how these small changes would impact carbon dioxide emissions overall. These collaborative exercises encouraged the group to think about how they as MIT students can help solve the world’s energy and climate challenges.